Powers/Abilities: Tanager wore an armored suit which allowed her to fly through unrevealed means. It incorporated a winglike cape, presumably for control purposes, as well as taloned gloves. Her primary weapon was a throat-mounted device which created sonic disruptions projected as a concussive force. The disruptions also damaged and disabled unshielded electronics. The suit's functions were apparently operated via helmet-mounted vocal controls. In at least one mission, she carried threadlike magnesium cutting strips. History: (New Warriors I#35) - Tanager was part of an Air Force unit (along with Killer Shrike and Sparrow) dispatched by Air Command to free Joshua Clendenon, the mercenary know as Cardinal, from Riker's Island prison, in which he had been confined after his defeat as chief of security for Sea Urchin. Tanager melted through the bars of Clendenon's cell window, after which Sparrow tore the wall open and Killer Shrike provided him with his Cardinal armor (or a duplicate thereof). With that mission accomplished, the four were reassigned to eliminate the New Warriors. Cardinal used his suit's sensors to trace the Torpedo armor held by Mike Jeffries and Mickey Musashi to Peconic High School in Long Island, NY, where Nova (Richard Rider) was training the pair in their shared identity of Turbo. Musashi, who was the more skilled of the two, had just completed her workout, and Jeffries was beginning his, when Air Force arrived. Jeffries was quickly taken out of the fight, and Air Force teamed up against Nova, who was just barely able to stay ahead of them. He did manage to score a solid hit on Tanager, ruining her sonic disruptor, before being sent crashing into the bleachers by her teammates. By this time, however, Jeffries had managed to return to the fight, and he was able to lead Air Force into a trap set by Musashi. A combination of underground water mains and a power cable leading to the football stadium lights shocked the four mercenaries into unconsciousness, and the Warriors called the police. (Night Thrasher II#4 - BTS) - Tanager and her teammates were apparently either protected or released from incarceration and returned to Air Command. (Night Thrasher II#4) - Gloria Hancock, CEO of Hancock Transport Airlines, paid Air Command to get revenge against the Taylor Foundation for denying her airline the use of their airfields in Bosnia-Herzegovinia. The Air Force team fielded to carry out her mission included Cardinal, Sparrow and Tanager, but Oriole replaced Killer Shrike. (Night Thrasher II#5) - Air Command's flying headquarters overtook the Learjet carrying Dwayne Taylor (secretly Night Thrasher) and the Taylor Foundation's board of directors. After Air Force overcame initial resistance from Sprocket, Taylor's pilot, Tanager and Sparrow checked the cockpit and determined that they'd captured all but one member of the board. The missing man was, of course, Taylor, who had slipped away to fight Air Force from the shadows. Unwilling to reveal that he was Night Thrasher, Taylor used onboard equipment to track the mercenaries' armor, and ambushed Tanager in the plane's cargo bay. She fought back with her sonic disruptor, but Taylor was able to defeat her. He then ambushed Oriole in a similar fashion, and determined that he could modify Tanager's headgear to operate the armor of all of the Air Force agents. This allowed him to defeat Sparrow and Cardinal. Holding Cardinal captive inside his own suit, Taylor convinced Air Force to try helping people like the Bosnian-Herzegovinan refugees instead of themselves. Faced with the alternate prospect of being thrown from the plane in nonfunctional armor, Air Force reluctantly agreed. (New Warriors I#54) - Air Force was transporting supplies to Rwandan refugees at a camp in Goma, Zaire, when a savage firefight erupted. The team tried to engage the attackers - a mind-controlled squad of superhumans called the Soldiers of Misfortune, who were acting on behalf of the terrorist group called Undertow - but were ultimately defeated. Only Cardinal managed to escape from the massacre; Sparrow was captured by Undertow, while Tanager and Oriole were killed on the spot. Comments: Created by Fabian Nicieza, Craig Brasfield and Jeff Albrecht. Tanager was pretty profane in her Night Thrasher appearance. Of course, so was everyone. She did call Thrash a "chocolate Richie Rich", but seemed to get on fine with Cardinal and Sparrow, so I wouldn't assume she was a racist. Just kind of a jerk. The two Air Force operatives killed in New Warriors I#54 are drawn as Tanager and Killer Shrike, but an editor's note in #56 identifies them as Tanager and Oriole. My assumption, since Oriole has not subsequently appeared and Killer Shrike has, is that Oriole was the Air Force member in Zaire. Either way, Tanager is dead. It's not clear if Air Force is operating under Air Command's supervision after they take to humanitarian aid. Regardless, with Oriole and Tanager dead, Sparrow under the control of Undertow, and Cardinal having renounced his criminal past, Air Command would seem to be pretty short of operatives at this point. Of course, they might still have Killer Shrike, and it's hard to believe an organization as huge as Air Command seems to be would have a grand total of five superpowered agents to send on missions. There's no shortage of bird-themed criminals, after all. 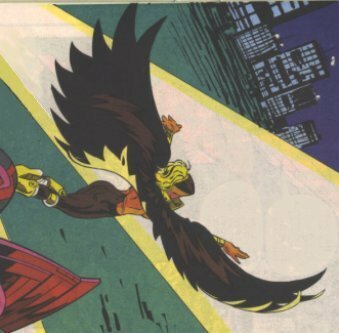 Possible Air Force operatives might include Peregrine (Alain Racine), Raptor (but probably not at the same time as Killer Shrike), Vulture (Toomes, Drago or Shallot), Bluebird (but probably not at the same time as Toomes), a new Bird-Man, or even Flying Tiger or Blackwing of Heavy Mettle.